The Paderno-Milan power project was built simultaneously with Niagara Falls. The generating plant was the same size as the original Niagara installation – 15,000 horsepower. The difference between the two projects was that Niagara only transmitted 2000 horsepower to Buffalo, while Paderno transmitted all 15,000 horsepower to Milan, making it the largest power transmission in the world at the time. 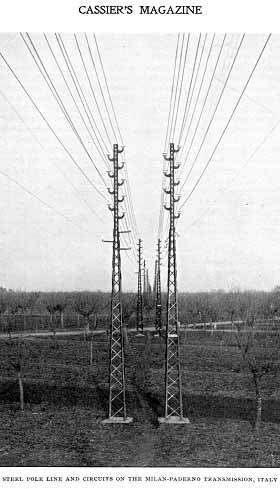 Duplicate three-phase lines, each of 9 wires, were supported on steel towers and ran at 14.5 kV. 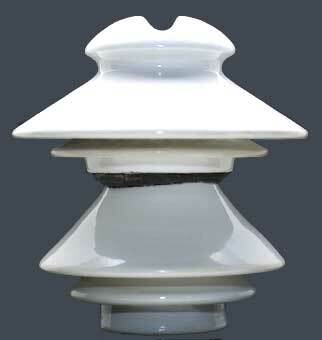 Special insulators were designed for the line, many of which were in service until recently.